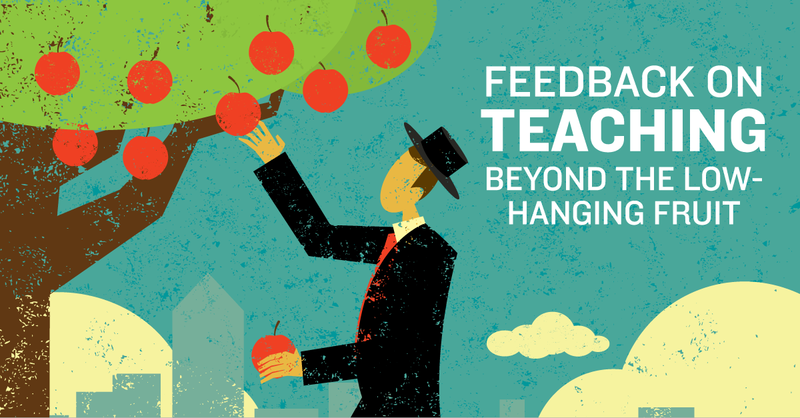 How can school leaders provide feedback that actually helps teachers improve their practice? The traditional approach is to observe, then give feedback that includes suggestions about specific changes to make. It's a tough impulse to resist, because we've been conditioned to believe that any kind of observation that isn't accompanied by suggestions for improvement is a wasted opportunity. Suggestions are appealing because they're action-oriented. When we give teachers one specific aspect of their teaching to change, and specific advice on how to change it, it feels like we're making a difference. It feels like we're having an impact. But I'm convinced that our feedback often gets better when we temper the impulse to make suggestions. Let's look at when suggestions are helpful—and when they're not. In Leverage Leadership, Paul Bambrick-Santoyo describes a robust model for providing feedback to help teachers make rapid improvements. His model involves intensive cycles of observations, post-observation meetings to identify changes the teacher should make, and follow-up observations to create accountability for making the agreed-upon changes. If you're working with teachers who have never had much feedback on their teaching, or who are new to the profession, there are solid reasons to make specific suggestions. If a small change can have a big impact, there's no reason to ignore the opportunity. It's important to understand, though, that this is the low-hanging fruit of improvement in our profession—the easiest and most obvious set of changes to make. Picking this fruit may take us from mediocre to good, but it will never take our schools from good to great. What's worse, when we take the same approach with more experienced teachers, or with more advanced elements of teaching practice, we run the risk of making suggestions that are decidedly counterproductive. Let's look at each of these situations in more detail. First, when suggestions are based on inadequate information, they can give the observer a false sense of accomplishment, while frustrating or misleading the teacher. During a brief 5-minute walkthrough, it's easy to simply miss parts of the lesson that would obviate a certain suggestion, or to misjudge the effectiveness of a particular aspect of the lesson. That's why I recommend treating walkthroughs as a source of information that can be used to start conversations about instruction—not as a "pop quiz" that gives teachers a list of things they're doing wrong. Second, when feedback puts teachers in a role of passive compliance, it removes the greatest opportunities for professional growth. Here, the risk is not so much that the feedback will be inaccurate as that it'll be a distraction from bigger opportunities for improvement. If a teacher is working on an ambitious new lesson design, but the observer's feedback focuses on a minor student engagement strategy, for example, an opportunity has been missed. More critically, the teacher has been conditioned to listen and obey, rather than to inquire and grow. Finally, when feedback is a one-way transfer of expertise from observer to teacher, it limits the opportunity for instructional leaders to continue to grow. Our greatest resource for professional growth is the teachers we supervise, who can challenge us to think more deeply about teaching and learning, and can push us beyond our personal experience in the classroom. So if suggestions aren't the ideal form of feedback for teacher growth, what is? I believe that deep conversations about instruction create the best context for professional growth—for both the observer and the teacher receiving feedback. These conversations are best begun with an evidence-based discussion of what actually happened in the lesson, because feedback is fundamentally about returning information to its source for re-processing. Put the microphone too close to a speaker and you'll get one kind of feedback; share what you observed with the teacher, and you'll get a similarly amplified result. Here are ten ways to phrase feedback, without making suggestions, in order to lead to better discussions about teaching and learning. "I noticed that you [ ]...could you talk to me about how that fits within this lesson or unit?" "Here's what I saw: [ ] ...is that what you thought was happening at the time?" "I noticed that [ ] ...how did you feel about how that went?" "I noticed that students [ ] ...how did that compare with what you had expected to happen when you planned the lesson?" "I saw that [ ] ...what did you think of that, and what do you plan to do tomorrow?" "At one point in the lesson, it seemed like [ ] ...did it seem that way to you, too? What was your take?" "Tell me about when you [ ] ...what made you choose that response?" "I noticed that [ ] ...could you tell me about what led up to that, perhaps in an earlier lesson?" "I found myself wondering if [ ] ...is that something you're thinking about?" "What effect did you think it had when you [ ]?" Notice a theme here: good feedback begins with noticing specific aspects of the lesson, and sharing those observations with the teacher as the starting point for the discussion. When we share evidence-based feedback, then stop talking and listen, we can have a far greater impact on teaching practice than if we're too quick to make suggestions. To learn how you can make a habit of conducting high-impact classroom walkthroughs, sign up for the free 21-Day Instructional Leadership Challenge. Justin Baeder is Director of The Principal Center and host of Principal Center Radio. He helps school administrators transform their productivity, multiply their impact, and speaks regularly at conferences and professional development events.